January 2010 | Tired, Need Sleep. This would be a great gift for a friend or family member (after you read it yourself, of course). If you are interested in winning this, leave a comment below (mandatory first entry). If you are a follower or subscriber to Tired, Need Sleep, leave another comment for a second entry. This contest is only open to those who have a U.S. shipping address. The contest will end at midnight on February 1st, and I will pick a winner at random on February 2nd. Please make sure to enable your email address or leave it in your comment. I will notify the winner via email (and a post on the blog) on Feb. 2. If I have not heard back from the winner within 48 hours, I will pick a new winner. Good luck! I know you will enjoy this little book! Bob Perks has written a warm, friendly, and inspiring book in I Wish You Enough: Embracing Life’s Most Valuable Moments One Wish at a Time. The book is a compilation of anecdotal stories relating to the idea behind each phrase of the poem (sun/rain, happiness/pain, gain/loss, hello/goodbye). The stories are very touching and thought-provoking. This is a book that will give one the desire to embrace all of life – the good and the bad – as a gift from our Father in Heaven. The author’s words brought me to tears several times, and had me bursting with joy a few times too. This book is a treasure you will want to share with everyone you love. It helped me see a richness in every day life that changed my perspective for the better and has helped me remember to slow down and savor each moment. This is a book well worth reading and passing on to those special people in your life! We are still loving our Mind Blowing Science kit! It continues to engage and fascinate M.
First, we had two cups of water. We added a couple of scoops of baking soda (our base) to one cup and a couple of scoops of citric acid (our acid) to the other. Then we added some red cabbage powder and watched as one cup turned red (acid) and one turned blue (base). So far this was stuff we had already learned, but it was still fun for Mad Scientist M.
Then we got out these tiny little polyacrylamide crystals: This photo is enlarged… in reality these crystals look a lot like sea salt, but are maybe a tiny bit smaller. We added 2 scoops of crystals to each cup of colored water. We couldn’t see them any longer and M thought they had disappeared or dissolved. We set the timer and waited about 30 minutes. Here you can see they are starting to gel up: The instructions say to wait 2 hours. So we kept on waiting…. 2 hours later, here’s what we had: Pretty purple, pink, and blue crystals. Really, the picture above looks very greenish, but they were actually a pretty blue (grrr… stupid old camera). AND they were no longer hard, but squishy and soft. The polyacrylamide crystals are a special plastic that will slowly soak up liquid and become soft. We are going to let them dry out and then we’ll have pretty, sparkly, tiny little colored crystals. For more science with kids, go see Adventures in Mommyhood! So, the latest is this set of count and clip cards. The child counts the hearts on each card then clips (using a clothespin clip or anything similar) the correct number along the side. These go from 1 to 12. I printed my set on cardstock and laminated them in order to make them a bit sturdier for the clothespins. You can print them by clicking on the thumbnail below. Let me know if you use them! 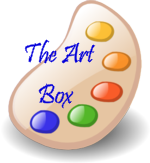 Several recent posts from Adventures in Mommydom inspired me to put our old playdough in M’s Art Box this week. (By “old”, I mean it was made a couple of months ago and has been mixed with enough other colors of playdough that it’s starting to look not-so-pretty. Besides, I’m itching to cook up some Valentine playdough sometime soon!) With it I included a little divided container with googley eyes, buttons, sea shells, beads, and glass mosaic pieces. I also included some pipecleaners. Aren’t they cute, especially the last one?? He had a ton of fun with this. So now I know exactly what to do with the playdough when it’s time to make a new batch! This will definitely be a somewhat regular addition to M’s box. I also put a roll of electrical tape in the art box. M saw it and knew exactly what it was for. We’ve only done this once before (here), but it’s been hanging on the wall ever since and from time to time he has asked to do the “tape painting” again, so I knew he’d be interested. I let him cut the pieces of tape himself and he put them wherever he wanted, then began painting (first with do-a-dots, then with tempera). I love how it turned out: He said it was a “deep, dark forest” and then “sunshine”. We had recently read We’re Going on a Bear Hunt. I think this may be where he got the deep, dark forest idea. He loved taking the tape off!! Join in and link up your kid-art below! It’s so much fun to see what they do on their own! M is 40 months old. This was a pretty light week for Tot School. I had quite a bit planned and ready to go, but M spent a large amount of time each day in pretend play and was so happily amusing himself, I just let him do his own thing. I expected him to ask to “do school”, but this really only happened on Monday while I was busy (of course!) with housework. So… perhaps we are entering into a more involved creative play phase? I eavesdropped as much as I could and heard some pretty interesting and exciting things going on. :) It’s always a little stunning to me to realize that my little baby is a real boy and can think on his own and make up stories and well, who knows what else! Am I the only one feeling a bit of bewilderment at this sort of thing?? Anyway, enough rambling. M did his (independent) shelf activities while I cleaned Monday afternoon, and there are almost no action shots of these. Sorry, I know those are always more fun! We have been singing and playing our instruments a lot and listening to some cds. If anyone has any children’s music recommendations, I’d love to hear them! We learned a fabulous and cute new robot song. Listen to it here! On one of his shelves I put out a foam tray (this was originally a mushroom container at the grocery store), and a plastic needle with yarn. He poked the needle through the foam wherever he wanted and then pulled the long length of yarn through. He had so much fun with this and came to show me his “design” several times: I have to say this was definitely one of the hits of the week! His marble track came out and he put it together with only a little mama-direction. He loves this and it’s always fun. M was finally able to go outside and PLAY! Yay! We made Monkey Bread on Wednesday. Yum, yum! He really loves to bake with me and I need to do more of this kind of thing with him. We have had a challenging couple of weeks lately with M’s behavior. However, things are looking up and he has acquired some new freedoms and been given some new responsibilities. After I-don’t-know-how-many-months of trying to teach him to put one thing away before getting something new out it seems to have really sunk in! He has been so great about this and usually puts toys and activities away on his own without being asked. It’s absolutely heavenly! :) Of course there are always a few exceptions because he will need more than one thing in his play quite often… but I’m telling you, the bedtime clean up has gotten so much easier and quicker. Normally we only have 3 or 4 things to put away! Whoo-hoo! Because it used to be 20! He’s also started making his own peanut butter and jelly sandwiches, and he’s allowed to use the microwave to cook his own chicken nuggets. :) This is all under very close supervision you understand. But still, he’s doing great and the more we work at making it fun for him to be a big boy, the better his behavior has gotten. 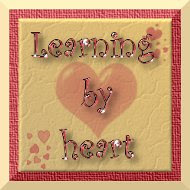 For more Tot School posts, check it out here! Hands down, the favorite of this week has been Jan Brett’s The Three Snow Bears. This is a take on Goldilocks and the Three Bears, a fairytale which M has never heard. I have read several versions of Goldilocks, so I can’t remember if the bears are friendly in the original story or not-so-friendly. But in this one the three snow bears are nice, good bears who spend their morning saving a pack of sled dogs who are floating out on a large piece of ice (ice floe? ); yet, they are not exactly welcoming of the little girl they find has been in their home while they were gone. It’s a good combination of knowing they are good… yet knowing they are still bears! It’s a fun story to read and M has asked for it daily. 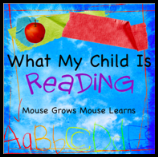 For more children’s book recommendations, visit Mouse Grows, Mouse Learns! We’ve been reading Bible stories every morning since a little before New Year’s Day. As you can imagine, we are way past the creation of the world by now. However, it’s always good to review and M really enjoyed *creation* activities. M was also interested in the fact that ostriches have wings but can’t fly. He liked that they are fast runners though! We also talked about the hump that camels’ have and how they store water in them. This led to a discussion of the desert and jungle for the land animals. M decided I should’ve made a desert paper and a jungle paper instead of just one paper for all the land animals. That way we could’ve sorted them a little better. What can I say? He’s right; I need to start running my ideas by him while I’m still in the planning stages, hee hee. This idea was from here. Then we made a fun sticker collage with foam stickers. First I traced M’s hand on green paper, we cut the hands out and glued them to blue paper to make grass. We added a little pond at the bottom. We added cotton balls for clouds in the sky. M put the sun in the sky and drew a little face on it all by himself. :) He thought it looked a little silly, but I think it looks great. ;) Then we got busy with the other stickers. We made flowers and added animals in the grass, fish in the pond, even a couple of birds in the sky! There’s even Adam and Eve, and if you look closely you’ll even see an apple tree with a cat in it (sorry, no snake!). :) M was so proud of his creation and he showed this to Daddy as soon as he came home. He said, “It’s the world that God made! !” So sweet! Our Nest, by Reeve Lindbergh. I am in love with this sweet book. It’s a perfect bedtime story, making everyone feel safe and secure, as it talks about all the “nests” we have – our homes, our towns, our world, our universe… all of creation is our “nest”, a place to be cared for and loved. The book mentions creation, but does not mention God. However, I do feel that God’s loving hand is implied in the wording. It’s a beautifully illustrated book and a wonderful way to talk about God’s creation with a child! Our second experiment in our science kit used red cabbage powder (which looks purple), citric acid, and baking soda. We put water in two cups, then added the cabbage powder to each and watched as the water slowly turned a very pretty purple. M added citric acid to one of the cups, then baking soda to the other. The first one turned a pinkish red and the second one turned blue! The citric acid and baking soda are both white, so M did not expect the color change at all! Baking soda is a base, citric acid is an acid, and the cabbage powder is a neutral. The cabbage juice is a natural dye, and adding a base or acid to it will cause it to turn either red or blue. For more science fun, check out Adventures in Mommydom! Science Experiments – ooh! ahh!